Among those first eight women were two recent William & Mary grads, Mary Pat Carroll ’77 and Jo Anne Carlton ’77. Carlton says she has no idea why she and her fellow trailblazers were chosen for the honor. Their jobs were not exotic — Carlton was an administrative and legal officer and Carroll was a communications officer. Yet, their arrival on board the repair ship U.S.S. Vulcan was greeted with a phalanx of photographers and reporters from all over the commonwealth, nation and world. 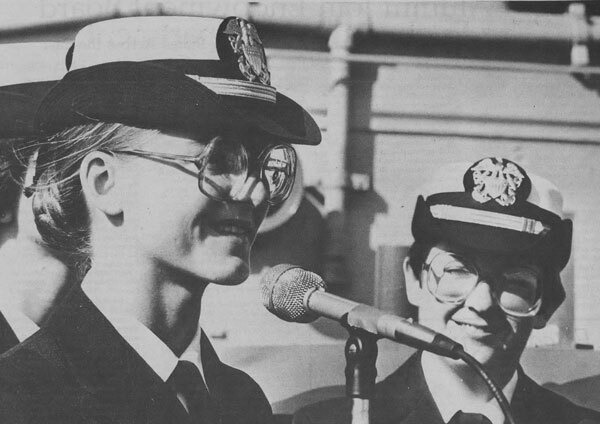 Women joining the regular fleet was not without controversy. In Owens v. Brown, four Navy women alleged that they had been disqualified from sea duty despite the fact that their jobs involved repairing and maintaining equipment primarily found aboard ships. When the court ruled their barring unconstitutional, there were many voices, both male and female, that claimed female sailors would lower readiness and morale. The wives of male sailors wondered aloud if these women would steal their husbands. Because all of the women served in different departments, there was little in the way of daily interaction, although Carlton and Carroll roomed together and Carlton recalls that they often ate meals together. Nonetheless, Carroll and Carlton claimed at the time that their experience aboard the U.S.S. Vulcan had been, well, smooth sailing. After her time on the USS Vulcan, Carlton ultimately spent her entire career in the Navy, retiring in 2004. It never was her intention to spend her life in military service, but she remains happy with her choice to this day.